It's hard to believe it's been 5 years already! My husband George and I have had many adventures in the past few years, but none is as sweet a memory as being whisked off to Las Vegas to get married! 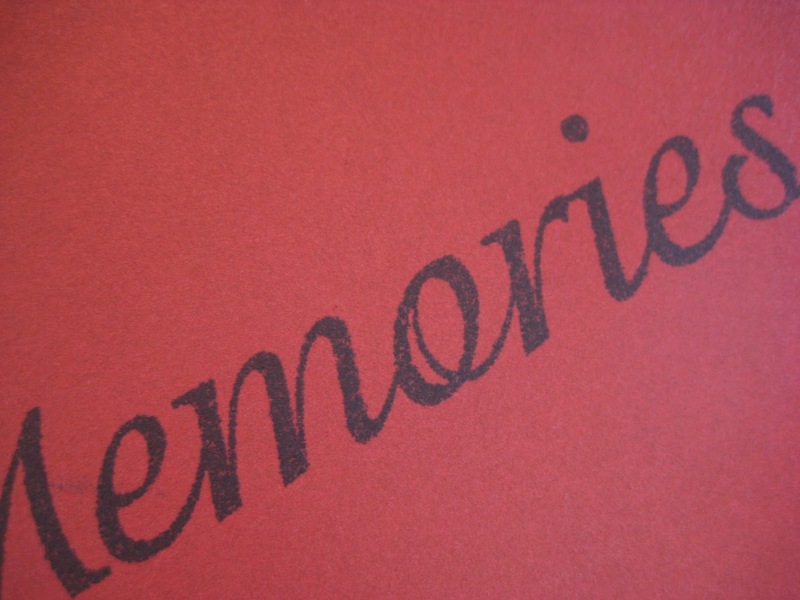 Crafty Ann's Challenge Blog - "Memories Are Made of These"
I have some old favorite stamps from when I was a CTMH consultant. So, I pulled out "Wedding Words" to make this heat embossed background. I also used some "vintage" grosgrain ribbon from CTMH in Outdoor Denim. I added three Studio G gems...I think it looks like a tuxedo shirt, don't you? The picture is from my CD which I bought of ALL the pictures taken at our wedding...it was expensive, but now look what I can do with it! The frame is a Sizzlit from Sizzix called Decorative Label Set. I used a corner rounder on the photo. 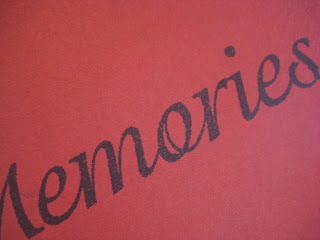 Inside this Cranberry Cardstock (also CTMH) card, I used a SeeDee stamp set to print, "Cherished Memories"
I can't fit into that dress anymore, but the memory is still sweet. Thanks for looking, and I hope I made you smile and reminisce. 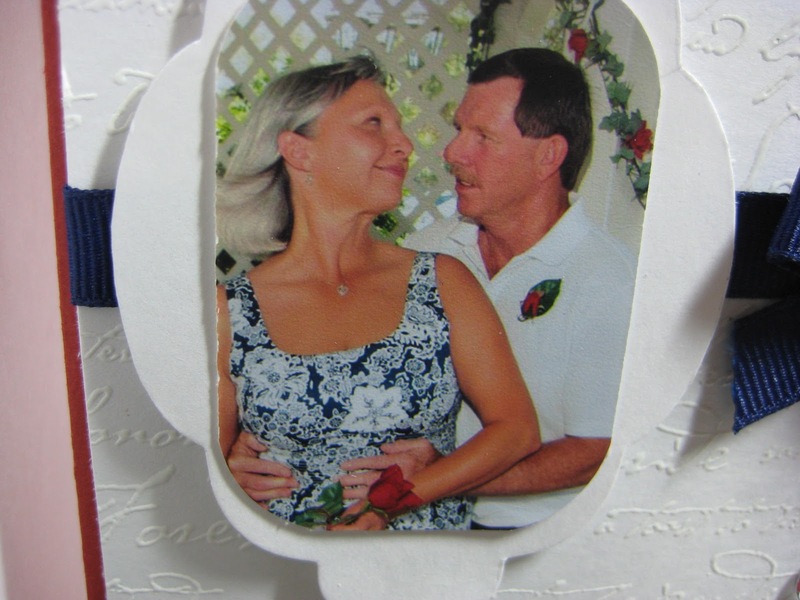 Lovely, creative card, and how nice that you were able to inlcude the photo of the happy couple. Very nicely done. Thank you for entering this week's challenge at Card Crafter's Circle. A fabulous creations Bev... I love the simple style... really sets off the picture! Thanks for sharing at the Card Crafter's Circle! What a pretty card!! I love that white paper you used!! Thanks for joining us this week at Frosted Designs! This is just wonderful! I love your wedding picture and how you've created the simple tux! 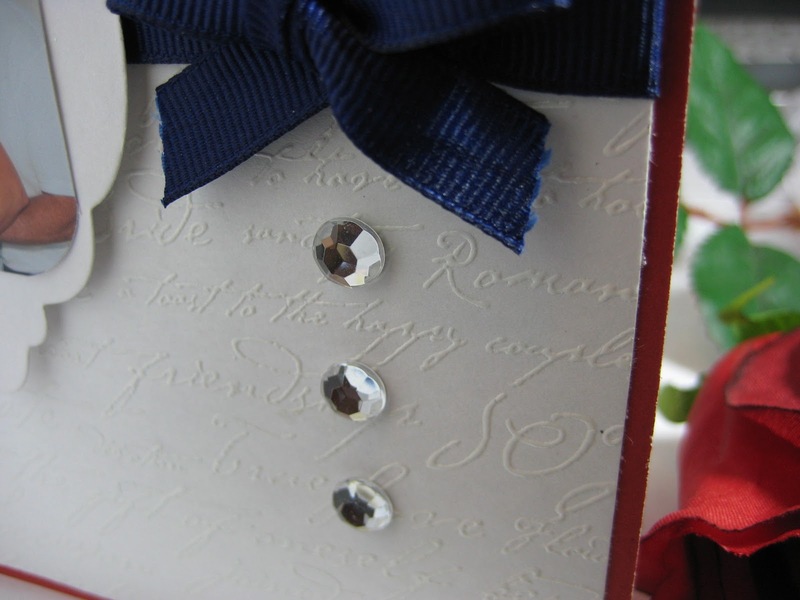 Wonderful embossing to! Thank you for sharing with us at Card Crafter's Circle! It's beautiful.I love the photo on it..Thanks for sharing it with us at ATCs and Cards with Attitude. Very Creative! Thank you for joining us at Card Crafter's Circle...in just a few hours we will have a new challenge up and we hope you will join us for this challenge too! It is lovely to look back on such happy memories isn't it. I love this creation - your ribbon is super. Thanks for sharing with us at Crafty Ribbons this time.